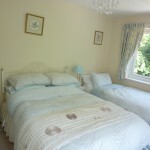 There are two light and airy rooms available throughout the year (Bluebell and Rose Room). The Magnolia Room is available during July & August only. 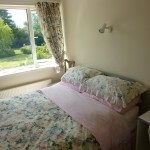 The Bluebell Room (4m x 3m) has two large windows facing south & east, with views to the front of the house and woodland. 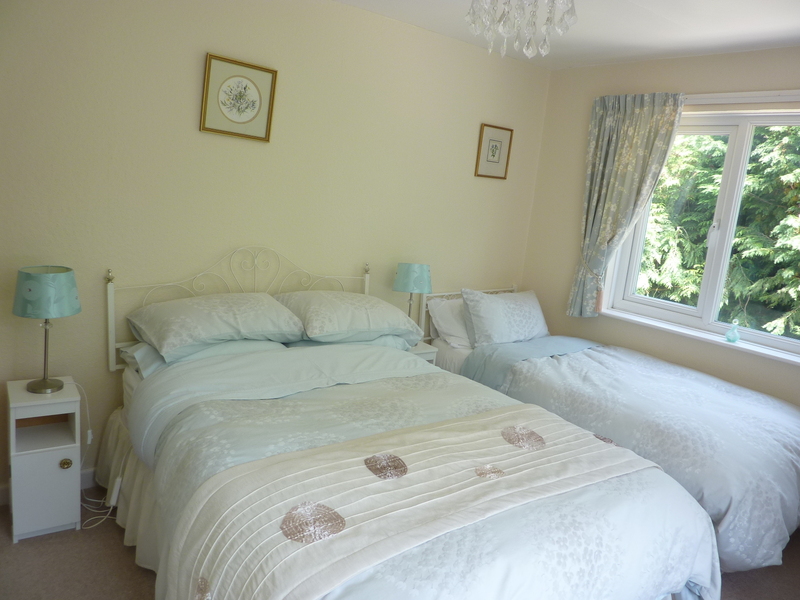 Cool in summer, it has a double and a single bed as well as an ensuite shower room (1.65m x 1.6m). 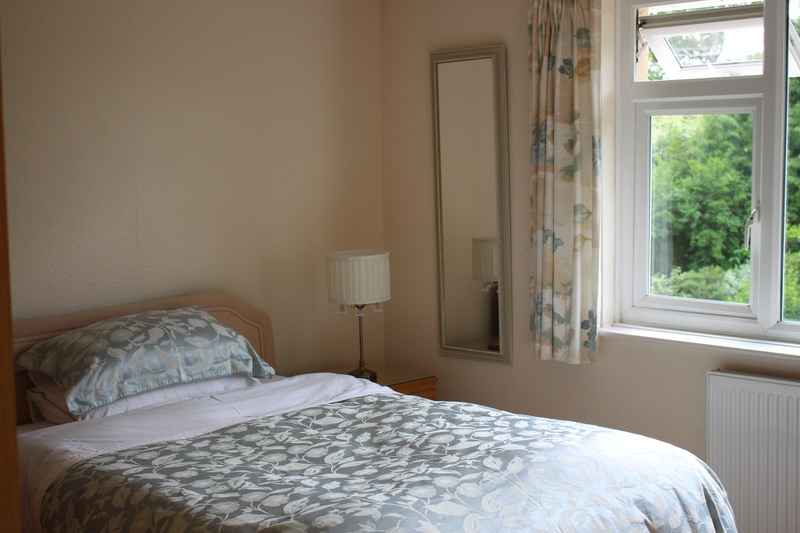 With a central view over the peaceful garden, the Magnolia Room (3.6m x 4.2m) faces west and has a double bed with ensuite corner bath & shower over. The side of the bath is quite high (0.6m) and may not suit those that are less agile. Additional beds for children aged 7+ can be made available on request. The Rose Room (3m x 2.7m) is a cosy room facing west. 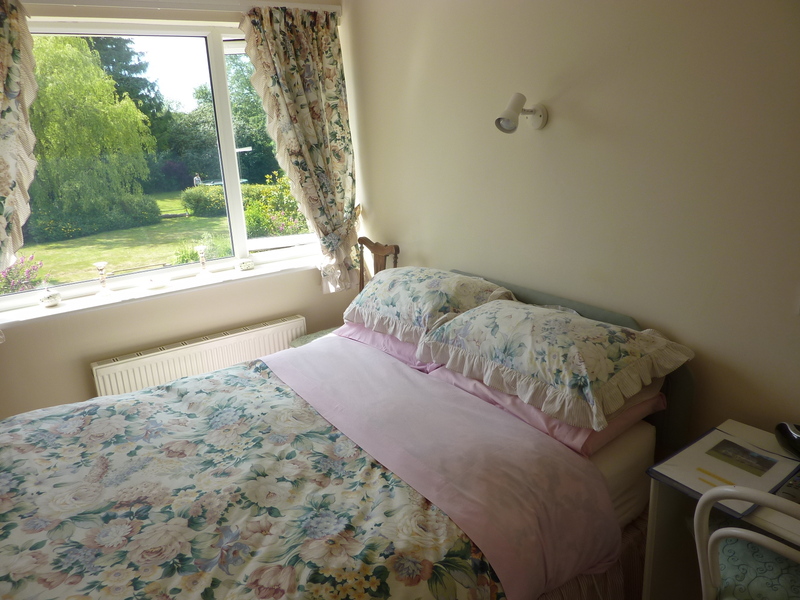 It has a double bed with its own shower room (2m x 1.65m) close by and is perfectly situated to take in the scenic garden view. All rooms have a Smart TV, tea & coffee tray & hairdryer. Served in the conservatory overlooking the garden. Choose from juice, a variety of cereals, various fruits, yogurts, croissant, toast, jams & marmalade, freshly ground coffee and a selection of teas. Dairy and gluten/wheat free diets can be catered for if advised in advance. Available between 8.30am - 9.30am. 5 - 7pm. Rooms held by deposit but not checked-in will be re-let, unless by prior agreement. A charge of £5/hr or part-hour for early/late check-in applies. There is plenty of parking outside the front door which is directly in front of you on arrival. 10.30am. Late check-out by prior arrangement only. A charge of £5 per hour or part-hour applies. 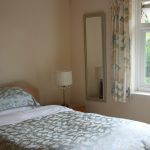 A non-refundable deposit of £20 per room per night is payable on booking by cheque, paypal or bank transfer. In the event of illness the booking can be transferred to an alternative at the discretion of the owner. Cheque payable to “Mrs T Tripp”. Bank transfer. Sort code 20-26-62. Account 80973572. Payment in full is due 7 days before the booking by cheque or bank transfer.